Tibetan history can be traced back thousands of years. However history that can be verified only dates back to the 7th century when Songtsan Gampo the 33rd Tibetan king sent his minister Sambhota to India to study Sanskrit who on his return invented the present Tibetan script based on Sanskrit. This period starts from Nyatri Tsanpo, the first of the Tsanpos, in 127 B.C(historians differ in view of the date, but this date is taken from the White Annales a reliable book on Tibetan history) and ends in 842 A.D. at the death of Lang Dharma the last of the Tsanpos who was assassinated by a Buddhist monk owing to Lang Dharma’s ruthless persecution of Buddhism. During this period some 42 Tsanpos ruled over Tibet among which Songtsan Gampo’s rule was considered as the zenith. Songtsan Gamoi was an outstanding ruler who unified Tibet, changed his capital to Lhasa, sent Sambhota to India to study Sanskrit and promulaged a script for the Tibetan on the latter’s arrival back in Tibet. He married Princess Wencheng of the tang Court and also Pricess Bhrikuti Debi of Nepal he also built the Potala and the temple and the temple of Jokhang. This period began in 842 A.D. the year of Lang Dharma’s assassination, and ended in about 1260 A.D, when Pagpa, the Abbot of Sakya monastery, became a vassal of Kublai Khan, the first Emperor of the Yuan Dynasty. During this period a little is known in history except that Tibet became decentralized into a number of petty principalities. This period began with Sakya’s rule over Tibet, followed first by Pagdu’s rule in Lhaoka and then by Karmara’s rule in the Tsang region (Shigatse). The sakya period was the time when Tibet officially became an inseparable part of China. This period lasted from 1260 A.D to 1642 A.D during which political powers centered in the three regions of Sakya, Pagdu, and tsang successively ruled over Tibet. This period is the period when the Dalai Lama ruled Tibet. It started in 1642 A.D. when the 5th Dalai Lama overtook the ruling power from the Tsang ruler. It basically ended in 1951 when Tibet was liberated and came to a complete end in 1959 when a rebellion led by the Dalai Lama was crushed by China and the People’s Government of the Tibet, Autonomous Region was set up. Basically, the Tibetan climate is not as harsh as many people imagine it to be. The best time to visit is between April and November, after which temperatures start to plummet.Central Tibet, including Lhasa, Gyantse, Shigatse and Tsedang, generally has very mild weather from April to November, though July and August can be rainy – these two months usually see around half of Tibet’s annual rainfall. October and November often bring some dazzling clear weather and daytime temperatures can be quite comfortable at Tibet’s lower altitude. The coldest months are from December to February. It is not impossible to visit Tibet in winter but you should bare in mind it is very cold however the low altitude valleys of Tibet (around Lhasa, Shigatse and Tsedang) see very little snow. Spring does not really get under way until April, though March can have warm sunny days and is not necessarily a bad month to be in Tibet. Lhasa – the border of Nepal/China: The Friendship highway is basically in good conditions year around. But from December to February, the thawed road could make some trouble Besides, try to avoid August – landslide could happen in the rainy season. Mt. Everest Region: Early May and early October are the best time to visit Mt. Everest. Due to the clear weather, you have great chance to see Mt. Everest’s true face. From December to February, it’s too cold to go to this region. But the magnetism of Mt. Everest always attracts people anytime of the year. Ali (Mt.Kailash): Even without climate restrictions this area is already inhospitable. Big rain and snow can make the journey even worse. However, for those determined tourists, the appropriate time is May, June, July, September and October. Eastern Tibet: Don’t touch this area in July or August the rain could ruin the road and make terrible landslides and in winter there is a possibility of the road being frozen. 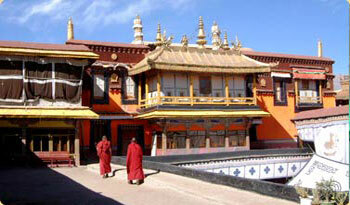 Northern Tibet:Has an average altitude of 4,500m this area offers very limited time for tourists. Summer is the prime time to enjoy the great plain in northern Tibet. It is the greatest festival in Tibet. In ancient times when the peach tree was in blossom it was considered as the starting of a new year. Since the systematisation of the Tibetan calendar in 1027 AD. the first day of the first month became fixed as the new year. On the New Year’s day, families unite ” auspicious dipper” is offered and the auspicious words ” tashi delek” are greeted. This festival is held on the 15th of the first lunar month. Huge yak-butter sculptures are placed around Lhasa’s Barkhor circuit. It is the holiest in Tibet, three memorable occasions coincide on this day, Buddha’s birth and Buddha’s enlightenment. Almost every person within Lhasa join in circumambulations around the city and spend their late afternoon having picnics at ” Dzongyab Lukhang” park at the foot of Potala. Horse racing and archery are generally very popular in Tibet, and Gyantse enjoys the prestige of being the earliest place to start such a festival in 1408. Contests in the early times included horse racing, archery, and shooting on horseback followed by a few days’ of revelry and entertainment.Presently ball games, track and field events, folk songs and dances have taken over and a lot of trade and barter takes place. There are many horse racing festivals in Tibet the one in Nagqu in Northern Tibet is the most famous. August is the golden season on Northern Tibet’s vast grassland. Herdsmen on horseback in colorful dress carrying tents and local products pour into Nagqu. Soon they form a city of tents and various exciting programs are held, such as horse racing, yak racing, archery, horsemanship there is also a commodity fair. It is one of the major festivals in Tibet also known as the Tibetan Opera Festival. The founder of the Gelugpa (Yellow Sect of Buddhism), Tsongkhapa set the rule that Buddhists can only cultivate plants indoors in summer to avoid killing other creatures carelessly as creatures are most active in summer. This rule must be followed until the seventh lunar month after Bhuddists go outdoors to celebrate and yoghurt is served by local people. Since the middle of 17th century the Fifth Dalai Lama added opera performances to this festival and today famous Tibetan opera troupes perform in Norbulingka (Dalai Lama’s summer palace). It is believed when the sacred planet Venus appears in the sky the water in the river becomes purest and cures diseases. During its appearance for one week, usually at the end of the seventh and beginning of the eighth lunar months all the people in Tibet go to the river to wash away the grime of the previous year. Long long ago when Tibet was in danger of large scale invasion, the Kongpo people sent out an army to defend their homeland.It was in September and the soldiers worried that they might miss the New Year and the highland barley wine and other good things.So people decided to celebrate the Tibetan New Year on 1st October ahead of time.To remember those brave soldiers Kongpo people present three sacrifices and stay up at night from then on. Nowadays it has become the Kongpo Festival for entertainment with Kongpo dancing, horse race, archery and shooting. The farmers in Lhasa, Gyantse and Shangnan gather to celebrate harvest time and many people enjoy the entertainment on offer, horse racing is popular along with costume fashion shows, songs and dances, archery and picnics.